Tuesday, September 24th, 2013 . We are happy to announce that we have been named a recipient of the 2013 INTERNET TELEPHONY Excellence Award by TMC for the second year in a row. The award is presented by INTERNET TELEPHONY Magazine and honors companies that deliver exceptional IP communication solutions. Thursday, September 5th, 2013 . Never miss a call with our installable Chrome App! As you may have seen in PC World, we’ve been leveraging Chrome’s newest technology to create an always-on, installable version of UberConference. I’m excited to announce that as of today, the app is available for anyone using Windows or the Chrome OS! Learn more. 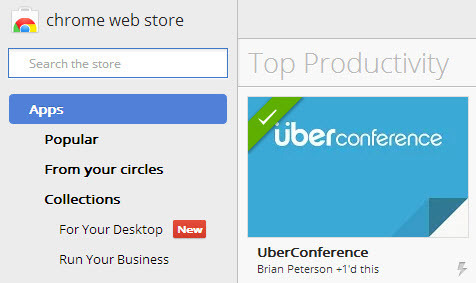 If you’re already a Chrome user, install the UberConference app heredirectly from the Chrome Web Store. If you’re not a Chrome user or want to learn more click here.